Get inspired with these beautiful easy arrangements that will wow your family and guests. This centerpiece filled with seasonal, natural elements is versatile enough for any holiday occasion. 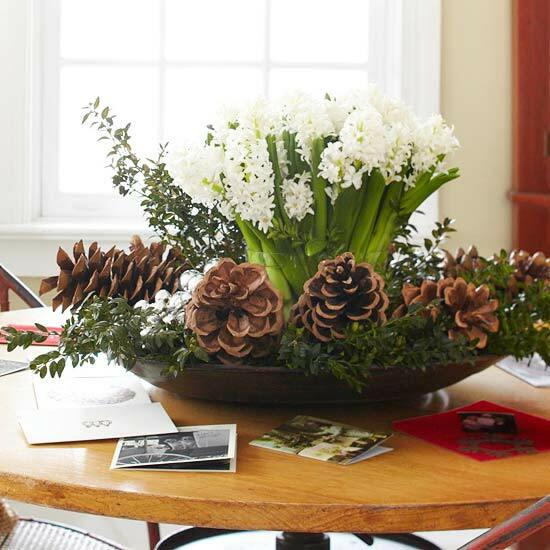 Simply fill a large, low bowl with boxwood, pinecones, and white hyacinth. There's nothing sweeter than this sugary holiday centerpiece. Fill an ebony wood compote with artificial snow. 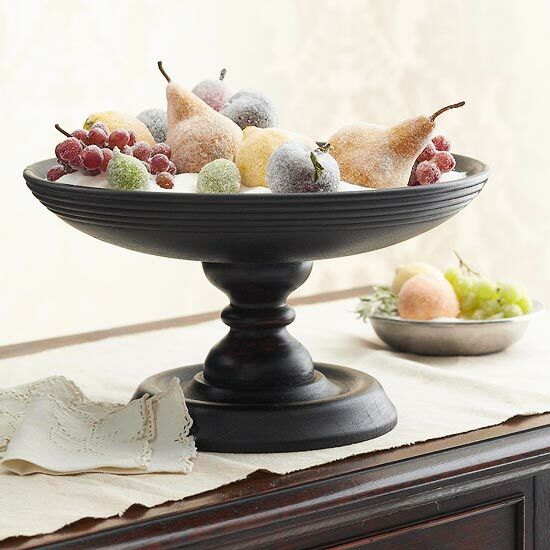 Embellish with wax sugar-coated pears, plums, and grapes. A holiday table is even cozier when layered in winter whites. To make the runner, cut felt by the yard to the needed length and 18-24 inches wide. Trace halfway around a drinking glass at the ends of the runner to create scalloped edges; cut out with scissors. Embellish with punched scalloped-edge circles. On smaller sections of felt, punch more scalloped-edge circles, and wrap felt around oversize glass vases. 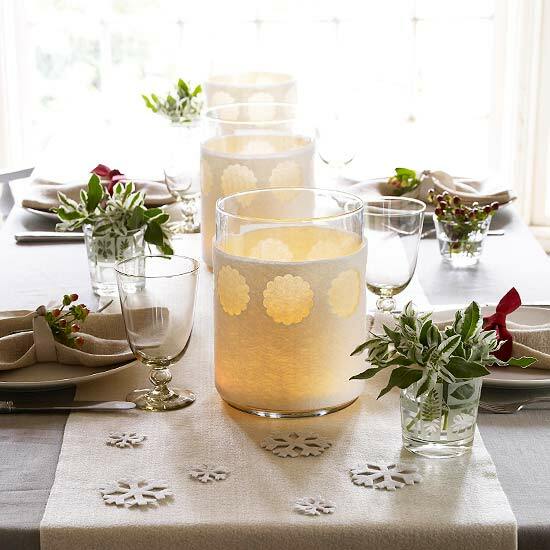 Insert candles for a soft, wintry white glow, and scatter felt cutout snowflakes across the table runner. Elevate a humble wooden box to Christmas-centerpiece status. Start by lining the box with dry florist's foam to anchor evergreen sprigs. 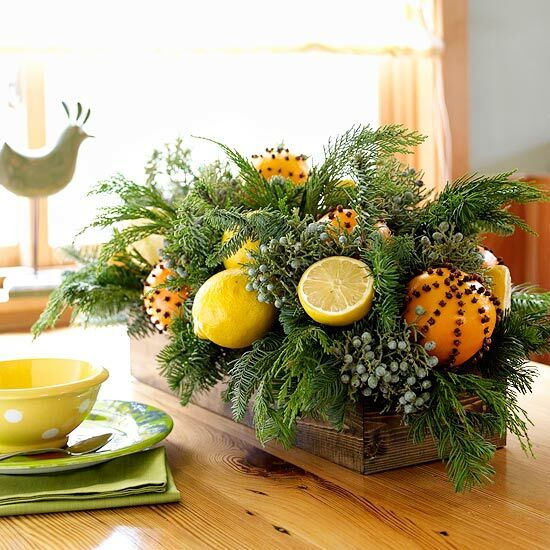 Attach citrus fruits (lemons, oranges, limes) to florist's picks and tuck into the greenery. Add interest by cutting some of the fruits in half or adding decorative details. Editor's Tip: Make orange pomanders by using a large needle to poke holes into the orange. Push the stems of whole cloves into the holes. Large white hydrangea blooms fill a white pitcher (or try a bowl!) with fresh floral splendor. We added seeded eucalyptus leaves and a few stalks of white snaps and filled in with golden holiday ornaments on wires. Fresh green and red apple slices surround the neutral centerpiece with a bright border. 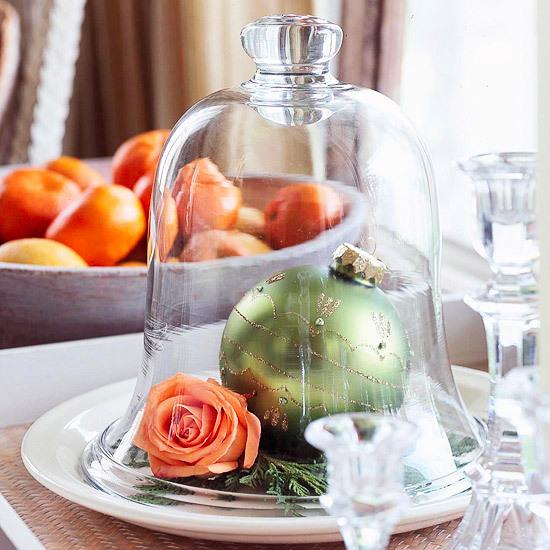 A clear glass cloche on a platter or tray plays host to a few perfect decorations: one stunning holiday ornament, a few sprigs of evergreens, and a single perfect rose. Keep the rose fresh by inserting the stem into a florist's water tube, which can be concealed under the greenery. 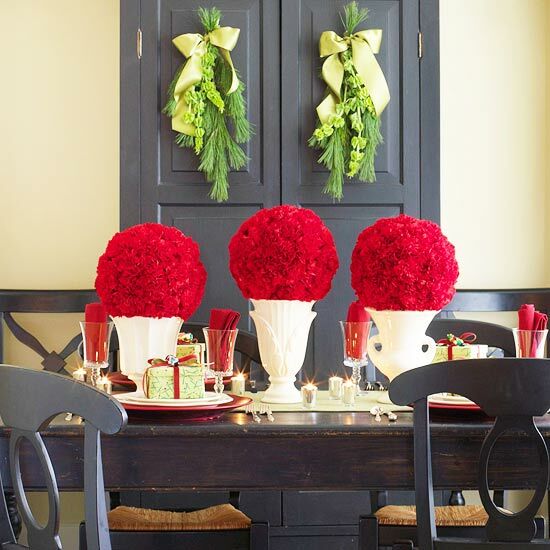 This tabletop take on pomander balls makes an eye-catching Christmas display. Simply soak florist's foam balls in water and cover with red carnations. 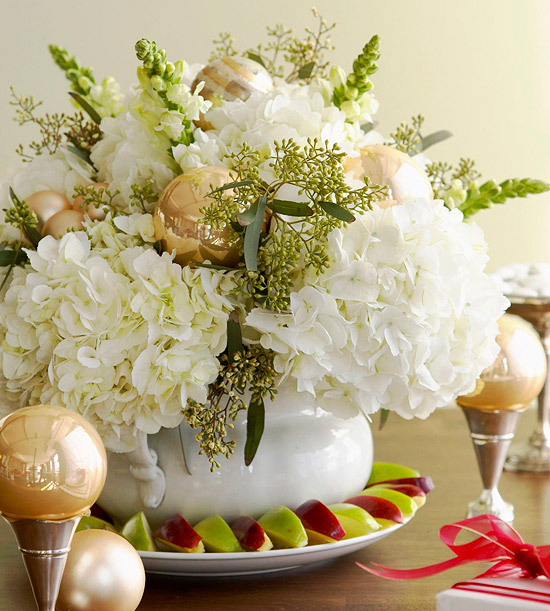 Place the finished balls atop white vases or urns placed in a row in the center of your table. 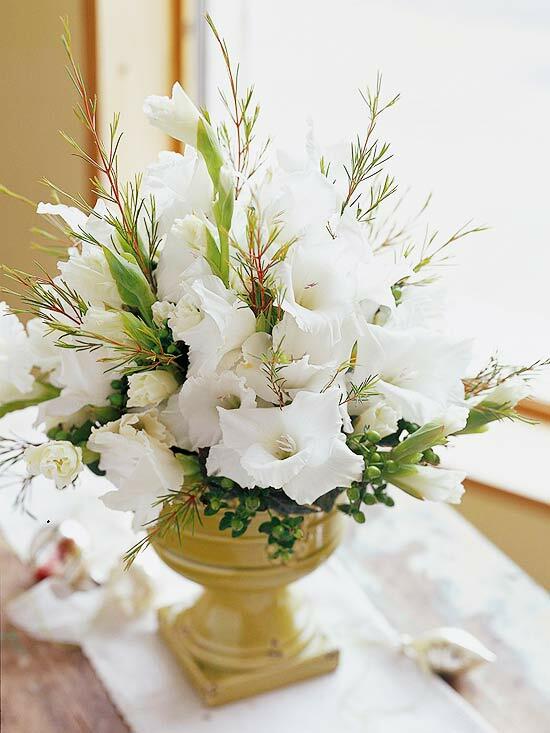 For this organic centerpiece, insert a chunk of wet florist's foam into the bottom of the urn and fill with water. Cut each gladiolus stem into three or more sections, with at least two florets on each section. Insert the cut ends into the wet foam, turning the container as you work. Add filler around the base and up through the flowers (we used green hypericum berries and waxflower foliage). This setting for brunch reflects a relaxed country French approach to decorating. 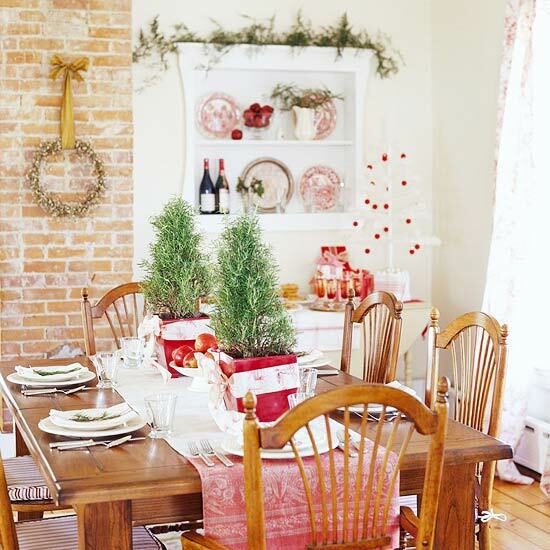 The dining room features a red-and-white color scheme as a backdrop. 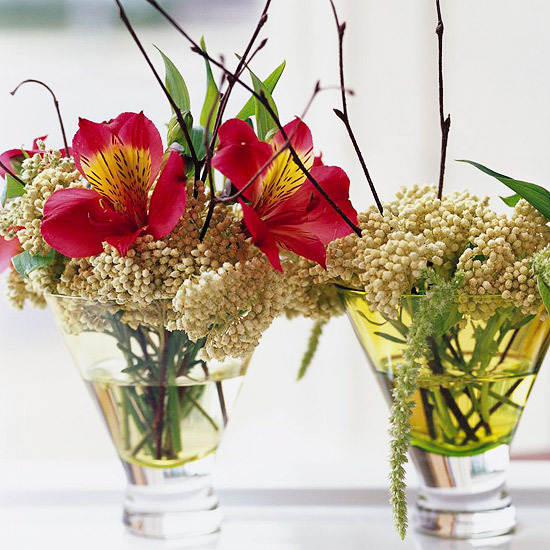 Decorate your table with small arrangements of alstroemeria and birch twigs. We added a filler of beige rice flowers and long, green amaranth seed heads. Find similar shaped flowers at your local florist or grocery store. Or clip twigs from your yard for a personal touch. Copyright © The Manly. All Rights Reserved.